Smoothies are easy to make, taste delicious and can be extremely healthy. In order to prepare them, you need a good quality blender. Below are the best smoothie blenders available on the market. Has pre-programmed functions to allow control over the consistency of the smoothies you make. It is also capable of making other foodstuffs, like nut butter and salsa. Has three different sized cups with lids. The Ninja BL482Z has Auto-iQ Technology which is designed to ensure that optimum nutrient extraction occurs thanks to the pre-programmed functions that provide the right amount of blending for the task at hand. The control panel is very easy to use and also has a timer that lets you know how long you have left. It comes with three different sized cups enabling you to make single or extra-large portions of smoothies to take with you on-the-go. All of the removable parts are BPA-free and dishwasher-safe. The blender comes with a one-year limited warranty. This blender has a 1000 Watt motor and weighs roughly 5.6 pounds. It measures 15.5-inches high and 6-inches in diameter. Has Dual Stage Blending Technology to ensure you get the smoothest possible product. Simple to use with a dial to control the ten different speeds, as well as a single-serve option. Comes with three single-serve cups, complete with lids, for quickly making smoothies to take on-the-go on those busy mornings. Removable parts are BPA-free and dishwasher-safe. The Ninja Ultima BL830 features Dual Stage Blending Technology, meaning that it has crushing blades that chop chunkier, harder ingredients up before the cyclonic blades process them into a well-blended pulp. The simple control panel allows you to operate at exactly the right speed for your needs, with a maximum of ten speeds available; there is even a single serve option to use with the smaller cups. The blender comes with three single-serve Nutri Ninja cups in which you can blend your smoothie straight away and then cover with the accompanying lids ready to take on-the-go with you. The main jug can hold up to 72 ounces of liquid, whilst the single serve cups hold 16 ounces; they are all BPA-free and dishwasher-safe. The blender comes with a two-year limited warranty. This blender has a 1500-watt motor and weighs roughly 16.5 pounds. It measures 17.7-inches high, 7.3-inches wide and 10.9-inches deep. Multi-speed blender with pre-programmed functions to make it easy to create smoothies, puree and dough. Comes with a number of attachments, such as a blender jug, food processing bowl and travel cups, that allow you to reduce the number of kitchen appliances in your home. The Ninja BL682 features Auto-iQ Technology that is designed to make quick work of almost any ingredient you put into it. The options on the easy-to-use control panel include frozen drinks, smoothies and food puree. There is even the choice to make dough. Additionally, it can crush ice and grind most seeds with ease. With a number of attachments, including Nutri Ninja cups, 72-ounce blender jug and 64-ounce food processor bowl, the BL682 is incredibly versatile and capable of replacing a number of kitchen appliances. All of the removable parts are BPA-free and dishwasher-safe. The blender comes with a one-year limited warranty. This blender has a 1500-watt motor and weighs roughly 10.4 pounds. It measures 17.6-inches high, 7-inches wide and 9.8-inches deep. Has different functions to enable you to easily make things like smoothies, frozen desserts and soups. Manual speed dial allows you to easily control the speed of the blade. Comes with a timer than can be set so you can continue with other activities whilst you wait for your smoothie to be ready. Comes with a seven-year limited warranty. The Breville BBL910XL has five different functions that allow you to create soups, smoothies and frozen desserts. It also works very well on leafy greens to make green smoothies with no bits. The speed dial lets you easily and accurately control the speed at which you wish to blend, ensuring perfect results every time. The timer allows you to set the blender and forget about it until its ready. The 64-ounce jug is made from a heavy-duty plastic that is BPA-free and has a tight-fitting lid to help prevent spillage during operation. The auto-clean feature and the fact that it is easy to dismantle and wash by hand means that you can ensure that the blender remains hygienically clean. It also comes with a seven-year limited warranty direct from the manufacturer. This blender has a 2-peak HP motor and weighs roughly 18.3 pounds. It measures 18-inches high, 7.8-inches wide and 9.5-inches deep. Has a choice of single-serve cups or nine-cup jug within which to create smoothies. Powerful motor that allows you to easily blend frozen produce, including ice. As part of the safety design, the blender will not work if the arrows on the jug and motor are not properly aligned. The Ninja BL660 has three speeds to allow maximum control over the final product; these speeds also allow you to create a number of items other than smoothies, including sauces and soups. The plastic in this blender is BPA-free and all of the removable parts are dishwasher-safe. The jug has a 72-ounce capacity, which is ideal for people who make big batches or for families. The accompanying lidded cups allow you to easily create single-servings of your favourite smoothies and then store them in the fridge or take them with you on-the-go. A powerful 1100 Watt motor, in combination with the 6 stacked blades, makes light work of frozen fruit, vegetables and ice, whilst the control panel on the front of the blender means that using it couldn’t be simpler. This blender has an 1100 Watt motor and weighs roughly 7.6 pounds. Fully assembled with the larger jug, it measures 16-inches high, 12-inches wide and 9.2-inches deep. Crushes ice into a snow-like consistency with extreme ease. Three different speeds, as well as a pulsing function to help break up larger ingredients before blending. Safety feature that prevents operation if not properly assembled. The Ninja BL610 Professional Blender blends ice into snow with ease in a matter of seconds, making it perfect for creating refreshing smoothies and other drinks. It has a 72-ounce jug that is made from BPA-free plastic and is dishwasher-safe. The panel on the front of the blender enables you to control your speed with ease and includes a quick pulse option which helps break down big bits of ice and food before blending. The safety feature of this blender means that it is impossible to start blending until the locking mechanism is securely in place. It comes with a one-year warranty. This blender has a 1000 Watt motor and weighs approximately 9 pounds. Fully assembled, it measures 15.8-inches high, 10.6-inches wide and 8.2-inches deep. BPA-free and removable parts are dishwasher-safe. Comes with two different sized cups that also have lids for using on-the-go. The Nutri Ninja Pro BL456 is an affordable smoothie blender that is designed to handle the toughest of blending jobs, including crushing ice and grinding up seeds in order to provide maximum nutrient release. It is very simple to operate: you simply fill the cup with ingredients, screw in the blade attachment, then turn it upside down, lock into place and push down to pulse. The plastic parts of the blender are BPA-free and all of the removable parts are dishwasher-safe. The blender comes with two different sized cups, as well as screw top lids to allow you to take your smoothie with you for breakfast or lunch on-the-go. Its compact size means that the Ninja BL456 is ideal for small spaces and it can be taken apart and stored away with ease. A one-year warranty is included. This blender has a 900 Watt motor and weighs roughly 7.7 pounds. Fully assembled, it measures 14-inches high and 6-inches in diameter. Variable speeds and pre-programmed settings for smoothies, soups and frozen desserts. Comes with a five-year warranty and 30-day money back guarantee. Safety mechanism that prevents operation unless securely locked in place. The Vitamix 1891 operates at a variety of speeds, numbered between 1 to 9 and then high, and it also has three different settings to enable you to make frozen desserts, smoothies and soups with ease. The controls are incredibly sensitive, allowing you full control over the process. The large 64-ounce jug is ideal for families, is BPA-free and has a two-part lid so you can easily add ingredients whilst the blender is in use. Cleaning the Vitamix 1891 is a simple process thanks to its self-cleaning ability: add some water and washing up liquid, then run the blender on high for 30 seconds, rinse and leave to air dry; no need to wash by hand. The safety feature means that it will not operate unless it is securely locked into place. It comes with a five-year warranty direct from the manufacturer and a 30-day money back guarantee. This blender has a 2 horsepower motor and weighs roughly 10 pounds. It measures 20-inches high, 8.8-inches deep and 7-inches wide. Variable speeds to allow maximum control over the finished product. Creates enough friction heat after running at high speed for a few minutes to produce piping hot soup. The Vitamix 5200 has ten different speeds to allow maximum control over the finished product. If allowed to run at a high setting for up to six minutes, it will create enough heat friction to produce piping hot soup! It is so powerful that it can grind up even the tiniest of seeds to produce incredibly smooth soups and smoothies. Cleaning the blender is very easy: you simply add some washing up liquid & water and then run the machine on high for about thirty seconds, rinse out and leave to air dry. The 64-ounce jug is BPA-free and is large enough to suit the needs of most families or people who like to make smoothies in large batches. The blender also comes with a seven-year warranty. This blender has a 2-peak HP motor and weighs around 15 pounds. It measures 17-inches high, 13-inches wide and 13-inches deep. Comes with different sized cups and lids for use on-the-go. The Ninja Pro BL450 is designed to make quick work of any ingredient you can throw at it, especially ice and frozen produce. It is easy to use: you simply select your cup, fill it with ingredients and screw on the blade, then lock into place on the motor base and push down to operate. This design also means that the removable parts are incredibly easy to clean by hand, but they are also dishwasher-safe, allowing you to ensure that your attachments stay hygienically clean. The blender comes with one 18-ounce and one 24-ounce cup, two lids and a blade attachment. All of the removable parts are BPA-free and it also comes with a one-year limited warranty. Clear, light up buttons that avoid confusion, as well as a timer that lets you know how long you have left. Has six pre-programmed functions: smoothies, ice crush, ice cream, whole juice, batter and soup. Safety shut-off stops the motor if you manage to clog up the blender. Seven-year warranty from the manufacturer. The Blendtec Designer Series 1003219 has a control panel with pre-programmed functions and buttons that light up, thus preventing any confusion over which function is in operation. It also has a timer to let you know how long the cycle has to run. This particular blender is part of a series that has been designed to look beautiful, whilst also providing the best possible blending experience. A safety shut-off in the blender means that if you do manage to clog up the machine, it will stop automatically. The blender is also able to automatically adjust the speed to ensure that all of the ingredients are properly processed. The self-cleaning function is extremely simple: you add water & washing up liquid and run it on high power for about thirty seconds, then rinse the jug and leave to dry. It is BPA-free and comes with a seven-year warranty from the manufacturer. This blender has a 1560 Watt motor and weighs approximately 8 pounds. It measures 15-inches high, 7-inches wide and 9.2-inches deep. BPA-free and blades made from stainless steel. Is quiet and simple to use. Has two different cups for chopping and making smoothies, including lids for ease of storage. Has a choice of 4 or 6 blades to use, allowing greater versatility when it comes to processing your produce. 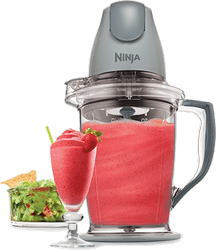 The Ninja Master Prep QB900B is an affordable, lightweight and efficient smoothie blender that can create smoothies from fresh and frozen produce. It comes with two different sized cups, one for chopping produce and the other for creating smoothies, making it incredibly versatile and suitable for making things like hummus and nut butter, as well as smoothies. The containers also have lids, allowing you to immediately store them in the fridge for later. With the exception of the motor, all of the pieces are dishwasher safe. The non-slip base ensures that your blender stays securely in place during use and the choice of 4 or 6 blades allows you to adjust the blender to the ingredients you are working with. The plastic in this smoothie blender is BPA-free and designed to be durable. The blades are made from food-grade stainless steel and are very sharp, but easy to keep hygienically clean. This is a 400 Watt blender that weighs roughly 1.3 pounds and measures up to 12.2-inches high, 11-inches wide and 7-inches deep. Includes a motor base, tall cup, two short cups, two blades, two lip rings and two lids. Strong blades designed to extract the maximum nutrition from ingredients. Has a limited, one-year warranty. Is simple and safe to use, even by children. The Nutribullet is incredibly versatile, due to the different attachments that come with it, allowing you to create a variety of products, including smoothies, nut butters, smooth soups and baby food. The plastic is BPA-free and the removable parts are dishwasher-safe, helping you to keep the blender nice and clean. The blender is very simple to operate, you fill the cup with your produce, screw the desired blade on top, then twist the assembled cup into the motor and push down to operate. To stop the blender, you simply complete this process in reverse. The blades are strong enough to burst seeds open and shred even the toughest of ingredients to ensure maximum nutrition is released. It is capable of producing silky smooth smoothies in as little as 10 seconds, grinding up and pulverising anything from apples to flax seeds. The attachments that come with this blender include one tall cup, two short ones, two different blades and two lids. This blender also has a limited, one-year warranty. This blender has a 600 Watt motor and weighs roughly 3.6 pounds. The motor base measures 5.37-inches in diameter and 8-inches in height. Has a number of functions that allow you to make a wide variety of foods, including smoothies, iced drinks, batter, bread dough and salad dressings. A microchip monitors the efficiency and safety of the blender during use. Warranties included: three years for the motor, one year for the jar and lifetime coupling-and-blade warranty. Blendtec TB-621-20 Total Blender has a touch control panel with easy to understand buttons, allowing you to create a variety of foodstuffs, including smoothies and drinks; it can even produce things like batter and bread dough! The motor runs the blades at 29,000 RPM allowing it to crush ice effortlessly. The large square jug is durable and made from BPA-free material, whilst the blades are made from food-grade stainless steel. A microchip situated in the motor base monitors the blender’s various functions, including speed and motor safety, thus helping to prevent overheating. The blender has a self-cleaning function that is incredibly simple: you add some water & washing up liquid and run it on high power for a few seconds, then rinse out the jug and leave to dry. It comes with a three-year warranty for the motor, a one-year warranty for the jar and a lifetime warranty for the couplings and blade. This blender has a 1560 Watt motor and weighs roughly 7.3 pounds. It measures 15.5-inches high, 7-inches wide and 8-inches deep. Multi-speed operation, allowing you to chop, crush, liquefy and mix ingredients. Intelli-Speed Motor Control function to ensure optimum efficiency. The KitchenAid KSB1575ER has a control panel that is incredibly simple to use, with five different speeds that let you chop, mix and liquefy your ingredients; it also has a “crush ice” function, which crushes ice into a fine powder for use in drinks and smoothies. It has an Intelli-Speed Motor Control function that senses what is in the jug, then maintains or adjusts to the relevant speed setting. The jug can hold up to 60-ounces of liquid, which is about 8 cups, and is made from stain, shatter and scratch resistant plastic that is also BPA-free. Because it is dishwasher-safe, it is easy to keep this blender hygienically clean. This particular blender also comes with a five-year limited warranty. This blender weighs roughly 10 pounds. It measures 16.5-inches high, 8.5-inches wide and 9-inches deep. Has pre-programmed functions to allow you to make smoothies, soups and dips with ease; the speed dial also allows maximum control over the exact speed at which to operate the blender. Can be easily cleaned by hand, or by putting some warm soapy water in the blender and running for a few seconds. The Oster Versa BLSTVB-000-000 has three settings that enable you to make dips, soups and smoothies at the touch of a button. The speed dial allows you to effortlessly control the speed at which the blender runs and the pulse function breaks up big chunks of food before the blending begins. The large jar can hold up to 64 ounces of liquid, which is approximately 8 cups, and is made from BPA-free plastic that is designed to be durable and long-lasting. The blender can be cleaned quite easily by hand, or you can choose to put some warm, soapy water in it and run on high for a few seconds, then rinse and leave to dry. It also comes with a seven-year warranty. This blender has a 1400 Watt motor and weighs roughly 11.8 pounds. It measures 20.5-inches high, 9.2-inches wide and 10.2-inches deep. Is very simple to use thanks to the speed dial and basic functions on the control panel. Is BPA-free and the removable parts are dishwasher-safe. Comes with a three-year warranty for the motor and two-year warranty for parts and labour. The Waring MX1200XTX is incredibly simple to use, having a speed dial on the control panel that allows you to very easily control the speed at which it operates, thus being able to get your smoothie, soup or other foodstuff to the perfect consistency. The 64-ounce jug is made from super tough plastic that is also BPA-free and all of the removable parts are dishwasher-safe. It comes with a three-year warranty for the motor and a two-year warranty for parts and labour. This blender has a 1500 Watt motor and weighs roughly 13.7 pounds. It measures 18-inches high, 8.5-inches wide and 8.25-inches deep. Five speeds allowing optimum control over the finished product. Intelli-Speed Motor Control function to ensure efficient operation. The KitchenAid KSB1570SL has a simple-to-use control panel that has an “ice” function which makes short work of frozen fruits and vegetables, as well as crushing ice into a snow-like powder. It also has an Intelli-Speed Motor Control function that allows it to sense what is in the jug and maintain or adjust to the appropriate speed setting. The 56-ounce jug is made from tough, stain and scratch resistant plastic that is also BPA-free; the blades are stainless steel. Being dishwasher-safe, it is easy to keep this blender hygienically clean. It comes with a one-year limited warranty. This blender has a 550 Watt motor and weighs roughly 10 pounds. It measures 16.3-inches high, 8.5-inches wide and 9-inches deep. Smoothie blenders are specifically designed for creating smoothies from a wide variety of ingredients. There are a few different types to choose from, including blenders for families, for making green smoothies and even manually operated ones. Before diving into the different types of smoothie blender, it is perhaps best to explain the differences between smoothie blenders and regular blenders. Regular blenders do a pretty good job of making smoothies, there’s no denying that, but smoothie blenders have been specifically designed to tackle the tough job of making smoothies and making them really well. What that means is that smoothie blenders tend to be far superior when it comes to crushing ice and frozen fruits and vegetables, compared to regular blenders. Some smoothie blenders even come with a freezing function that helps prevent your smoothie from separating if you’ve used ice. Others also have a dispensing spout. Most people find that smoothie blenders are simply superior to regular blenders when it comes to ensuring that no little lumps and bits are left once the smoothie has been made, even when blitzing leafy greens. It is worth pointing out that the different “types” of smoothie blender literally just refer to differences in size, or operation, not that there are specific varieties for different jobs. Manual smoothie blenders, or smoothie makers as they are also called, don’t require electricity to run. Instead they make use of some kind of crank handle or plunger effect to pulverise and blend the produce into a smoothie. They are ideal for people who are on-the-go, or for use whilst camping, allowing you to continue enjoying the benefits of smoothie consumption, no matter where you are. Electrically powered smoothie blenders come in a range of sizes, from small ones that are perfect for individuals, to large ones that are ideal for busy families or people who like to make big batches in one go. As previously mentioned, smoothie blenders will vary in the additional elements they incorporate, including taps for easy pouring and freezing functions. Some even allow you to blend straight into a container that can be lidded and stored for later. Many people enjoy juicing for the health benefits that it brings, but there are also benefits to consuming freshly made smoothies, including the fact that they contain both types of fiber, insoluble and soluble, which are essential for good digestive health. Like with juicing, smoothies have already done a lot of the hard work for you by liquefying the produce before you consume it, which in turn makes it easier for your body to absorb nutrients. The consumption of homemade smoothies – made with quality, wholesome ingredients – can help to keep you hydrated thanks to the high water content, as well as enabling you to consume a huge quantity of vitamins and minerals from fruit and vegetables with very little effort. They are also excellent for people who need or choose to take a number of liquid or powdered supplements, but perhaps don’t like the taste. By making your own smoothies at home using a smoothie blender, you can be 100% confident in the quality of your ingredients and also not have to worry about nutrient damage caused by the pasteurising process that occurs when smoothies are produced on a commercial level for shops and supermarkets. Cost: The prices of smoothie blenders can vary greatly, starting from as little as $30 and costing as much as $500+. The price usually depends on the quality & power of the motor and the functionality of the blender. For most people, a blender in the $50 – $150 range will suffice. Capacity and size: these are two important factors to consider. It is important to ensure that the capacity of the blender is large enough for your needs. Blenders can have a capacity of as little as 15 oz, and can go up to 70+ oz. The size that you choose will depend on how large a smoothie you drink. With a small capacity blender, you might not be able to blend everything in one go. However larger blenders require more storage space. Motor power: the more powerful the motor, the easier it will be to liquidize your smoothie ingredients. A 1500 Watt motor will be able to pulverize harder ingredients much more easily than a 300 Watt motor. If you are going to be blending soft fruits and vegetables only, then a less powerful motor will do the job. But for nuts and seeds, you need some extra wattage. Convenience: Do you want something that comes apart easily and can be popped in the dishwasher? Perhaps you’re more concerned with a powerful machine that can handle all kinds of produce, but might be fiddly to take apart and clean? What about a smoothie blender that blends directly into containers that can be lidded and stored for later? It is important to think about how convenient you want your smoothie making experience to be, because an unpleasant, fiddly or time-consuming experience is likely to put you off using the blender more often, and that is money wasted. There aren’t really many risks and warnings associated with smoothie blenders, however it is important to remember to always follow the manufacturer’s instructions when assembling, disassembling and operating them. Improper use can lead to accidents and/or damage to the smoothie blender.